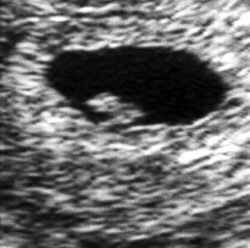 Q: How is a missed abortion or miscarriage diagnosed on an ultrasound (sonogram)? A: A missed abortion is a non-viable pregnancy that is destined to miscarry, if there is a fetus it has no heart beat. About one to two in five early pregnancies will not survive to delivery. Some will grow for a while, with HCG in the urine and serum, but eventually will stop growing normally, and then will stop growing at all. Most of these (two-thirds) will have abnormal chromosomes. Absence of any growth of the gestational sac or fetal pole over a 5-day period of observation. Gestational sac larger than 12 mm mean diameter (around 5 weeks 5 days) without visual evidence of a yolk sac. Absence of a visible fetal heartbeat when the crown-rump length (CRL) is greater than 5 mm. 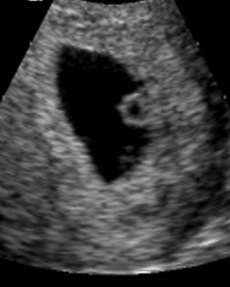 Yolk sac that is abnormally shaped or echogenic (sono dense rather than the normal sono lucent). No fetal cardiac activity, especially when it was previously seen.